my protection is the Holy Spirit. pray to the Holy Spirit. Believe and the Holy Spirit will help you. God is the source of our good works. The good we do is a result of the work of the Holy Spirit in our lives. The good we do comes through God’s gifts, Jesus’ example, and the Holy Spirit’s inspiration. And to the Holy Spirit, my helper and my guide. Catholics believe that there are three distinct persons in God: Father (first person), Son (second person) and the Holy Spirit or the Holy Ghost (third person). The union of these three persons in one God is referred to as the Holy Trinity. The New Testament contains over 90 references to the Holy Spirit, such as Spirit of Truth, Giver of Life. Jesus was conceived by the Holy Spirit. 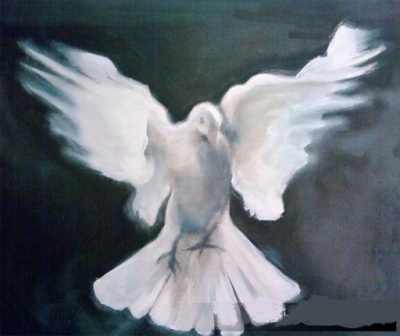 The Holy Spirit descended as a dove on Jesus during His Baptism. At the Last Supper Jesus promised to send the Holy Spirit to His apostles. Remember when the Risen Christ appeared to His disciples in the Upper Room. Here Jesus promised to send the Spirit of Truth, Who would teach them all the things they needed to know. Since the first century Christians have called upon God in the name of Father, Son, and Holy Spirit in prayer, absolution and blessing.